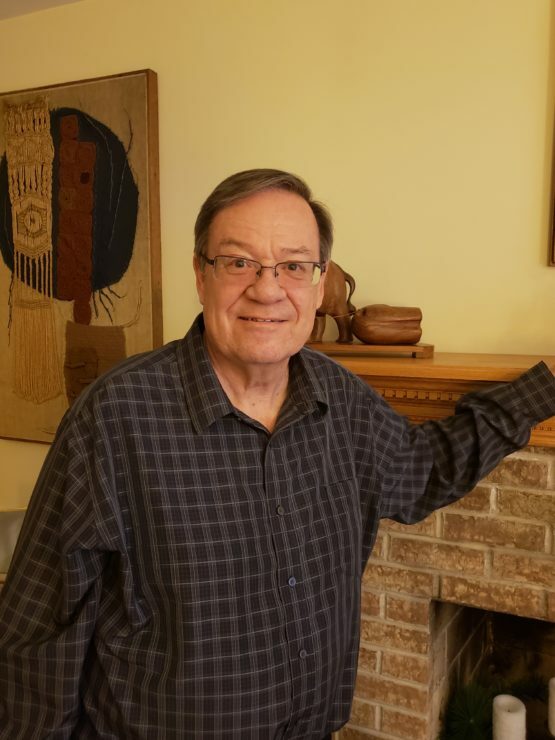 We are pleased to announce the appointment of Ken Hoke as the new Executive Director for the Brethren in Christ Historical Society. Ken has been a member of the Historical Society board for over 10 years and has broad experience within the Brethren in Christ Church. Ken was a pastor for 27 years, serving in the Great Lakes and Susquehanna Conferences. He served denominational general secretary for six years and has worked with Brethren in Christ U. S. World Missions for 15 years. He also served as executive director of the International Brethren in Christ Association for three years. Sometimes, these assignments were concurrent. 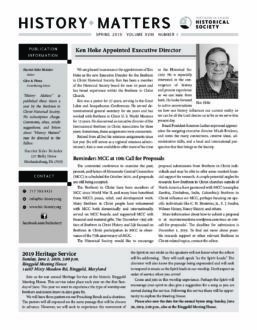 Retired from all but his missions assignments since last year (he still serves as a regional missions administrator), Ken is now available to offer more of his time to the Historical Society. He is especially interested in the convergence of history and present experience so we can learn from both. He looks forward to active conversations on how our history influences our current reality so we can be all the Lord desires us to be as we serve this present day. Board President Emerson Lesher expressed appreciation for outgoing executive director Micah Brickner, and notes the many connections, creative ideas, administrative skills, and a local and international perspective that Ken brings to the Society. The Brethren in Christ have been members of MCC since World War II, and many of our churches around the world have benefitted from the peace, relief, and development work that MCC has done. Many Brethren in Christ people have volunteered with MCC both domestically and internationally, served on MCC boards, and supported MCC with financial and material gifts. The December 1995 edition of Brethren in Christ History and Life focused on Brethren in Christ participation in MCC in observance of the 75th anniversary of MCC. The Historical Society would like to encourage proposal submissions from Brethren in Christ individuals and may be able to offer some modest financial support for research. A couple potential angles for research: how Brethren in Christ churches outside of North America have partnered with MCC (examples: Zambia, Zimbabwe, India, Colombia); Brethren in Christ influence on MCC, perhaps focusing on specific individuals like C. N. Hostetter, Jr., E. J. Swalm, Wilmer Heisey, Nancy Heisey, and others. More information about how to submit a proposal. The deadline for submission is December 1, 2019. To find out more about possible research support or other relevant Brethren in Christ-related topics, contact the editor. Please also save the date for the annual hymn sing: Sunday, June 30, 2019, 5:00 p.m., also at the Ringgold Meeting House. 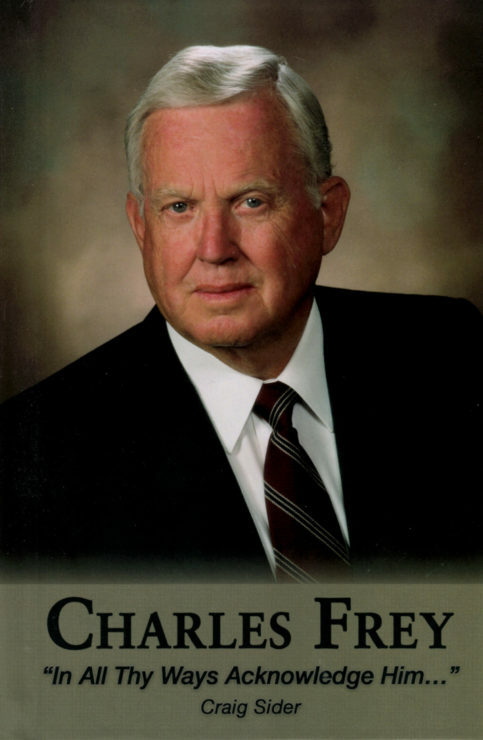 Charles Frey: "In All Thy Ways Acknowledge Him"
Editor’s Note: Several years ago, Craig Sider, former Brethren in Christ pastor and bishop and now president of Movement.org, started to write a book about 10 Christian leaders. Because he had a personal relationship with Charles Frey, he interviewed him first. As their conversations progressed, Craig realized he had too much material for just one chapter so he asked Charles if he could lengthen the chapter into a small book. Charles reluctantly agreed. Charles was a lifelong member of Manor (PA) Church and co-owned Turkey Hill Dairy until it was sold in 1985. He also served the wider Brethren in Christ Church at the denominational level and was a generous benefactor to both the church and Messiah College. Following is a brief edited excerpt from the book, reprinted by permission of the author. The book was written before Charles’ death in 2016. Copies are available for the cost of postage ($3.00 in the U.S.). Contact the editor. Standing alongside Charles for 60 years was his wife, Ann. Charles and Ann were 19 and 20 when they were married in 1945. When they started their married life together, Turkey Hill was very early in its development and Charles worked tirelessly to provide for Ann, to build the dairy, and to support their growing family. Charles and Ann’s family grew to include four children: Phil, Linda, Mike, and Nick. Each of the children note how family and work were significantly intertwined. Phil speaks to how life with his father was so integrally connected to farm and the processing plant. Mike says, “My earliest memories of dad are of him working hard. We worked really hard. In snow we worked 36-48 hours straight.” Linda recalls, “Dad would come home for dinner and then go back to work.” And son Nick notes, “I remember being around the dairy with dad at night. He had to go down and check the compressors.” Family like was a culture of work; it certainly wasn’t 9 to 5. As the family grew, Charles and Ann’s life together was rooted in faith in Christ and deep involvement in Manor Brethren in Christ Church. Sunday found the entire family engaged at Manor Church, but faith was far more than a Sunday expression. Linda recalls how family devotions were a consistent part of family life: “Each night we had family devotions at dinner and if the phone rang, it was ignored.” Faith, work, and family formed a complete whole. Through their 60-year journey together, Ann was a constant partner and a fixture of support for Charles. When she passed into the presence of Christ in April 2005, Charles lost his spiritual partner, his lifelong friend, and his confidant. The years that followed were difficult for Charles, adjusting to life without Anna’s presence and lacking the partnership that the two of them forged together over nearly six decades. But, as Scripture says in Psalm 30, “joy comes in the morning.” Charles’ morning came when he met and then married Beulah Landis on July 19, 2009, who became his new partner in life. If you sit with Charles long enough, listen to stories of his journey, and ask questions about key turning points in Turkey Hill’s history, clear leadership principles emerge. These principles grew out of an unwavering commitment to biblical truth and were forged not in the school classroom but in the crucible of decades of organizational leadership. Learn the art of negotiation. He is quick to admit that he has always enjoyed the negotiation process: making the offer, going back and forth, and closing the deal. With no inherent pride, he asserts, “Negotiating was my strong point.” Charles’ desire was for both parties to win. Give other people credit. Charles always had clear opinions, and was a capable decision-maker. And yet, with all those strengths, he was eager to give others credits for their ideas and hard work, and for navigating change. Have courage. Charles never calls himself courageous, but it’s apparent that each business decision required considerable courage. To him it wasn’t courage; it was simply taking the steps that needed to be taken to go forward. He consistently demonstrated the ability to lead Turkey Hill into the future with new approaches, new products, and new ventures. Periodically in my role as editor for the Historical Society, I visit the Archives to find a photo or missing piece of information or to do research. 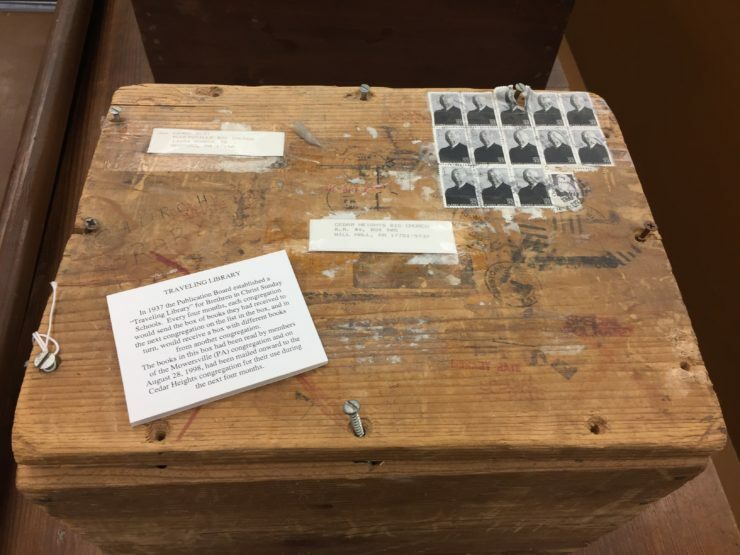 I don’t often take the time to peruse the exhibits, which perhaps explains why I never noticed the well-worn wooden box on one of the front display tables until recently. I read the caption describing the “Traveling Library,” was immediately intrigued, and wondered why I had never known about such an initiative before. We know that the Traveling Library continued operation until at least 1998 because the box in the Archives is postmarked August 28, 1998. That box had been shipped from the Mowersville (PA) congregation to the Cedar Heights (PA) congregation. I was curious about whether others remembered the Traveling Library and so posted the above photo on the Historical Society’s Facebook page. The response surprised me—and helped jog my own memory of a traveling library display at the Grantham Church many years ago that I had never connected to a denominational initiative. Many of those who commented on Facebook—almost all women—told of their memories of the traveling library. Many congregations were named: Cedar Springs (later Cedar Heights), Grantham, Harrisburg, Locust Grove, Mastersonville, Mechanicsburg, Palmyra, Refton, all in Pennsylvania; Nappanee, Indiana; Dallas Center, Iowa; Sippo Valley, Ohio; Zion, Kansas; Clarence Center, New York; and Springvale, Ontario. Respondents described how they eagerly looked forward to a new box of books, many of them hoping for another book by Grace Livingstone Hill (a popular Christian romance novelist). One person remembered working in the Christian Light Bookstore in Elizabethtown between missions assignments where she helped to pack boxes. One of only two men who responded noted that he was pastor of the Cedar Heights congregation in 1998 and thus may have gone to the Post Office to pick up the very same box that is currently in the Archives. The story of the Traveling Library box is an interesting confluence of the old and the new, and says something about how current technologies can help us tell the stories of the past. I made an interesting discovery in the Archives, a repository of “old” things, and then shared my discovery on social media, a newer technology. This in turn generated stories that offer some rich context to the artifacts and documents that quietly wait in the Archives to be discovered. Who knows what other interesting discoveries are waiting to be made, and what new stories they will elicit to enrich our understanding and knowledge of the past? Thanks to Archivist Glen Pierce for researching Publication Board reports to General Conference. Join us on Facebook. This irresistible picture of Enos Hess, president of Messiah College from 1923 to 1934, was in a photograph album prepared by Erma Hoover for her husband, Kenneth B. Hoover, on the occasion of his 90th birthday in 2001. Kenneth was a student at Messiah from 1930-33. It is not known if he took the photo or if it was snapped by someone else. The caption in the photo album: “Prof. 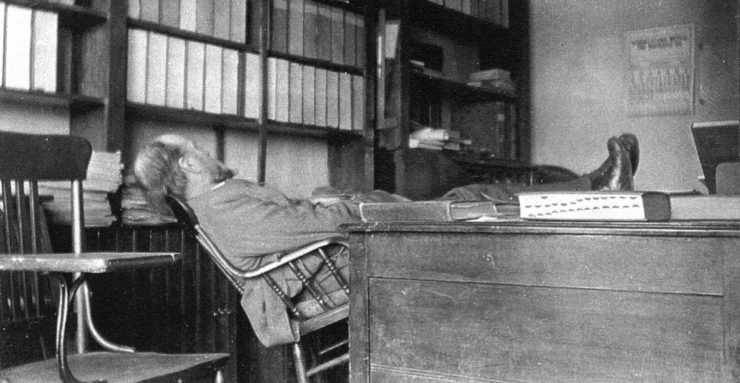 Enos Hess during an exam.” In addition to his years as president, Hess taught at Messiah from 1910 to 1941.